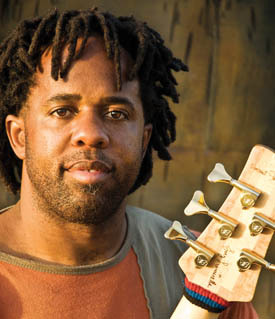 Bassist Victor Wooten began his musical career early. At age three, his brother Regi taught him to play bass, and at age five he made his stage debut with his four older brothers in the Wootens, playing songs by R&B mainstays like James Brown, Sly & the Family Stone, War, and Curtis Mayfield. After playing regional tours and opening for acts like Mayfield and War, the Wootens recorded an album in 1985. However, the record received little commercial or critical response, and eventually the Wooten Brothers found other gigs. By 1988, Victor Wooten moved to Nashville to join a rock band, and the following year met Béla Fleck, the banjo player for New Grass Revival. Fleck was forming a jazz group to appear on a TV show; he recruited Wooten, his brother Roy on drums, and Howard Levy on keyboards and harmonica. As the Flecktones, the group earned numerous accolades, including four Grammy nominations and a number one album on the jazz charts. Do you have a favorite bass player? Do you have a favorite bass player that you would like share with us? Tell us what is great and admirable about this bassist.